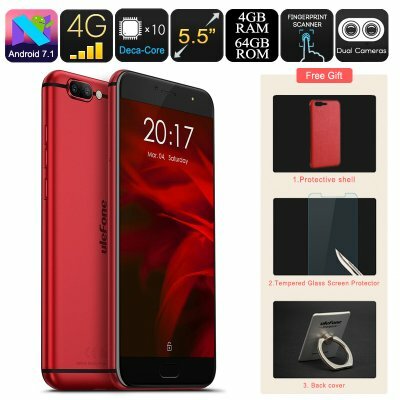 Successfully Added HK Warehouse Ulefone Gemini Pro Android Smartphone - Deca-Core CPU, 4GB RAM, Android 7.1, Dual-Lens 13MP Camera, Dual-IMEI (Red) to your Shopping Cart. The Ulefone Gemini Pro is China's latest flagship smartphone. This magnificent Android phone brings along some true power that has been packed into a sleek and stylish body. This latest Android phone runs on the Android 7.1 operating system. Thanks to this, you’ll be guaranteed to enjoy a smooth and lag-free user experience. This Android smartphone comes packed with the most recent software features available on today’s market – truly letting you take the most out of what it has to offer. On its stunning 5.5-Inch display, you’ll be able to enjoy your favorite media in 1080p resolution. No matter where you’re at, from now on you’ll always be able to enjoy a cinematic experience from the palm of your hand. It has been crafted out of Gorilla Glass 3, meaning you won’t have to worry about scratching or damaging your display during the day. Like most of the modern flagship smartphones out there, the Ulefone Gemini Pro features a state-of-the-art Dual-Lens camera. This 13MP camera allows you to snap breathtaking images and video at any given moment. With this smartphone camera at your side, you surely can take your mobile photography to the next level. It has been equipped with the Sony IMX258. This piece of hardware supports you in shooting professional-grade pictures that feature stunning details. Recalling memories through photographs and video’s has never felt this special before thanks to the Ulefone Gemini Pro. To take your connectivity to the next level, this latest Android phone supports two IMEI numbers. This allows you to use two network providers at the same time. For those of you that are searching for a powerful device to separate work and private life, this Android phone is a perfect choice. It additionally also comes with 4G and Dual-Band WifI. Thanks to this, you’ll always be able to browse the web at lightning speeds no matter where you’re at. With its 3680mAh battery, this cell phone allows you to use its features throughout the day without needing to worry about running out of juice. Packed within its sleek body, this flagship Android phone holds some stunning hardware. It has been equipped with the MediaTek6797 chipset that brings forth all power needed to enjoy the most demanding software. As a Deca-Core processor that is capable of reaching clock speeds up to 2.6GHz, this CPU delivers power while using a minimum amount of energy. It is one of the latest and most efficient processors on the market that will truly enhance your mobile user experience. Besides its stunning chipset, it comes with 4GB RAM and 64GB internal storage. Additional 256GB external memory supports guarantees that you’ll never run out of storage space with this Android phone. The Ulefone Gemini Pro comes with a 12 months warranty, brought to you by the leader in electronic devices as well as wholesale electronic gadgets..